Two men were arrested after an alleged burglary attempt on Graystone Avenue in Bartlesville on Friday afternoon. 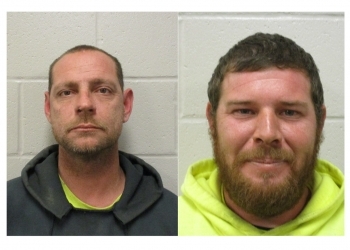 Jimmie Hoppock and Aaron Moore were each charged with first degree burglary and intoxication for their roles in the incident. Both appeared out of custody during an arraignment at the Washington County Courthouse on Monday. According to an affidavit, a victim stated that Moore kicked in the door of his residence. The victim was present with two minor children in the front room of the house while this was happening. Moore yelled threats at the victim when he tried to console one of the children. Another victim ran out the back door after Moore and Hoppock entered the residence. Officers made contact with the two men and noticed a strong odor of alcohol. Moore admitted to officers that their intent was to cause bodily harm after kicking the door down. Both men posted $10,000 bonds. They will next appear in court on March 1.